Three very loud and very different artists took the stage at Rhino’s in Bloomington this past Wednesday for a round-robin monster set, and it was a glorious experience. No Age provided the rough energy….Deerhunter gave us their trademark rocking weirdness….and Dan Deacon – well – the Baltimore-based electronic artist is every bit the maniacal genius that his albums suggest. Here is the music video I edited last night. I have been to a number of concerts over the course of the last two weeks and I must say that I enjoyed all of them, even if the Earlham College Gone Primitive show was cut short due to disrespectful students. There was a distinct difference in the level of how much I liked each show, which compels me to rank each show since the concert run has come to an end until summer. Krug and Co. Slay Dragons! Sunset Rubdown are back! Well, on June 23rd anyways, with their fourth full-length, Dragonslayer. 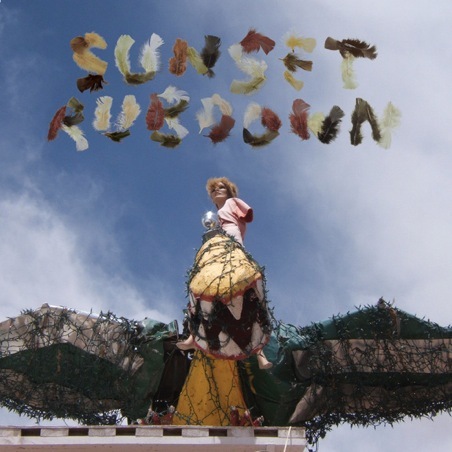 One of many different Spencer Krug projects, Sunset Rubdown also happen to be my favorite thing he is a part of and their 2007 Random Spirit Lover one of my 10 all-time favorite albums. Now comes the tough task of following up such a brilliant masterpiece, and on June 23rd it will be unveiled. I had the privilege of hearing early live versions of a lot of the songs on Dragonslayer during their fall tour last year, with the most breathtaking number being “Idiot Heart”. Looks like there is also going to be a rendition of the recently released “Paper Lace” that Krug penned for one of his other bands, Swan Lake, on their Enemy Mine. This is a day I’m marking with a double black Sharpie on my calendar, if they exist. 03.Apollo and the Buffalo and Anna Anna Anna Oh! Just this last Friday, one of the most significant bands that played a major part in the shaping of my musical tastes as I grew older, Silver Jews, officially called it quits. David Berman is one of the few true poets among today’s songwriters, setting himself aside from the rest with a vision all his own. They spent a good fifteen years making terrific music, and only since 2006 had they played live and went on tours. Whatever they were doing, it was always different and worthy of anticipation. Silver Jews, you will be missed. At least you left us with three of the greatest albums of the last 20 years (The Natural Bridge, Bright Flight, and American Water, respectively). I was lucky enough to see them not once – but twice – during their short time as a touring band. The most recent concert I attended from them was just this last October at Birdy’s in Indianapolis (which Berman proclaimed as their 101st live performance), this time as a more seasoned and comfortable rock outfit, settling into the new sounds of their latest record, Lookout Mountain, Lookout Sea. However, I am posting a video from the very first time I saw them, on April 14, 2006, at The Bluebird in Bloomington. Toward the beginning of their set, Berman had asked the audience to forgive their faults, for it was only their 13th or 14th time playing together in front of a real crowd. It was about as real and flaw-filled as a concert could get, and it was such a time-capsuled moment to see a brilliant artist perform. I will never forget it. Damien Jurado’s most recent record, called Caught in the Trees, is arguably his finest set of material. The song “Caskets” is the soundtrack for this music video. It’s a solid film.